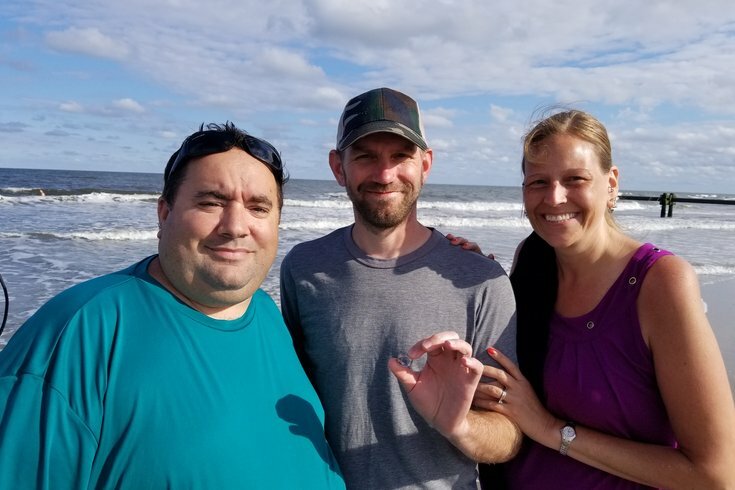 John Favano, left, traveled from Delaware County to help Dave and Donna Harter find a wedding band that Dave had lost in the ocean at the North Street beach on Wednesday, July 26, 2017. In retrospect, Dave Harter should have just listened to his wife. 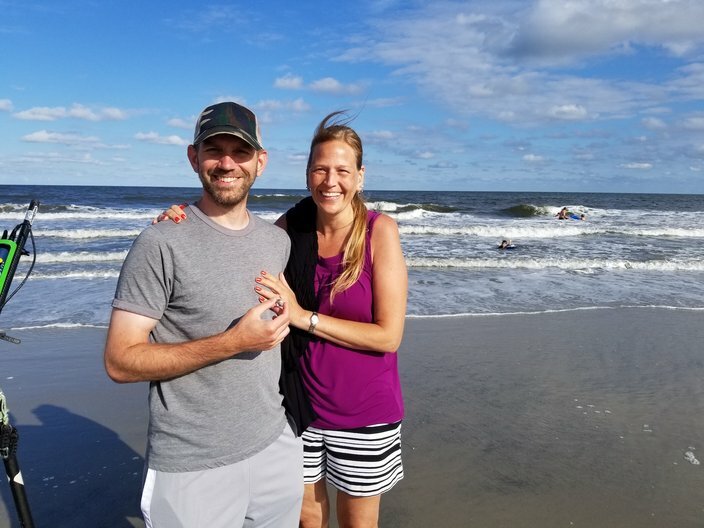 With their 11th anniversary looming in August, Dave, his wife Donna, their two children and extended family headed down for a vacation week in Ocean City, N.J.
On Wednesday afternoon, they walked up to the North Street beach for a relaxing day that turned out to be anything but. “I was going down to the water, and my wife asked me, ‘Do you want me to hold your (white-gold wedding) ring so you don’t lose it,’” the Collegeville resident recalled. When he went back to the rental house, he checked Amazon and found an $8 knock-off replacement for the sentimentally priceless item. That's not a viable option. Then, he started looking around for sites where metal-detector enthusiasts might log in to help in such circumstances. That’s how he found John Favano. And that’s how, about five hours later, the Ridley Township resident arrived at the scene to turn an awkwardly desperate situation into one of face-saving redemption. “He walked straight into the water,” Harter said of Favano. “I told my wife after 20 minutes that he was never going to find it. She knew that I was bent out of shape about it, so she was pretty good to me. What the Harters faced was a nightmare Jersey Shore scenario that plays out quite often along the coast. Favano knows it all too well, and it brings him great joy to help folks avert relationship peril. Like he did last week, the 42-year-old chef manager from Delaware County – by way of the Mayfair neighborhood of his youth – will drop everything and bring his metal-detecting gear to the ocean. As a young lad of single-digit age, he’d travel from Philadelphia to his grandparents’ place on Fourth Street in North Wildwood. With a Radio Shack-quality metal detector in hand, a hobby was born. While he’d set that hobby aside as a teen and 20-something, he returned to the game four years ago, with his wife Leia’s approval. It wouldn’t be long before he was finding historical relics in farm fields, and coins and other objects on the beach. He caught the fever anew and upgraded to a $2,000 model with all the factory options, so to speak. After all, what funis metal detecting at the beach if you can’t go in the water? So up and down the North Wildwood beach he’s strolled in recent years as his wife relaxes in the sun. He knows full well what’s going on. “People make fun of me all the time,” he said with a laugh. In fact, Leia has overheard people’s snarky comments all the while fielding questions from curious observers. Last year, he heard about the Ring Finders mission so he signed up with the spirit of helping others in mind. That’s not to say he performs the service for free. He works “on a reward basis,” but only if the item is found. He also asks that clients kick in money for gas and parking. On Wednesday, when Favano heard the beep of Harter’s Facebook message, he was getting ready to mow the lawn. 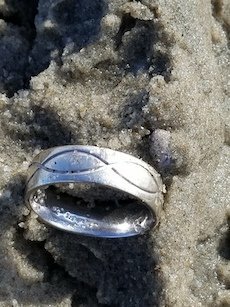 The wedding ring that John Favano found in Ocean City, N.J. on Wednesday, July 26, 2017. Around 5:45 p.m., he donned his gear, put some water shoes on and got to searching. It’s not always easy work. Those who’ve lost items tend to lose track of exactly where they were at the time thanks to lifeguards moving flags along the beach to alert swimmers where they can and can’t go. The dolphin sand sculpture proved to be a marvelous landmark in this case. He saw the Harters watching his progress. After about 45 minutes, Favano got a strong signal right around where the waves break closer to the beach. Dave and Donna Harter will celebrate their 11th wedding anniversary in August. Both of them will still have their rings, hopefully. He reached down into his scoop and grabbed something that he initially thought was a nickel but ended up being a symbol of the Harters’ love for one another. Nobody ever wants to be in that situation, but if you need Favano, you can reach out via Facebook. He'll get back to you with the quickness.